The new Amazon Echo Dot For Kids is that little green thing on the bedside table. "Alexa, why is Pluto so awesome?" "Alexa, what is seven plus three?" "Alexa, who is Harry Potter?" Families who have an artificially intelligent "smart speaker" at home like Amazon's Echo may be used to kids saying stuff like this. And Amazon (which is a financial supporter of NPR) has just announced that Alexa's going to get better at answering them. Last week, the company unveiled a new version of its Echo home device with a spill-proof case and a warranty. Amazon is also introducing parental controls, including time limits, for the Echo for the first time. Google Home, its biggest competitor, already has some. And, the Echo is adding a version of Amazon's kids' music, stories and games service, called FreeTime Unlimited, for $2.99 a month. Finally, they have "tuned" Alexa's "personality," with the help of child-development experts, to be more kid-friendly, and even to understand kids' voices better, like if they say "Awexa" instead of "Alexa". Toni Reid, vice-president of Alexa Customer Experience at Amazon, says that all this is a reaction to customer interest. They've been "excited and a little bit surprised" to see how much kids liked hanging with Alexa. Justine Cassell isn't surprised by this at all. She's associate dean for technology strategy and impact of the school of computer science at Carnegie Mellon University, and has been building AI interfaces for children for decades. She describes the appeal of these conversational interfaces as like being "the Mary Poppins of technology." "Ever patient, always on, never with her door closed, always ready for yet another game, always willing ... to answer yet another question." The updated Alexa is a little chattier than before, with longer explanations, more corny jokes and fun facts. It's also designed to model good behavior. The "magic word" feature offers positive reinforcement: When you say "Please," it replies "thanks for asking so nicely." If you tell Alexa you're sad, it will "empathize," and suggest it can play you a song, or that you should talk to a friend. Reid describes Alexa's personality as "humble, smart, helpful, sometimes funny." What this all adds up to is hard to predict. 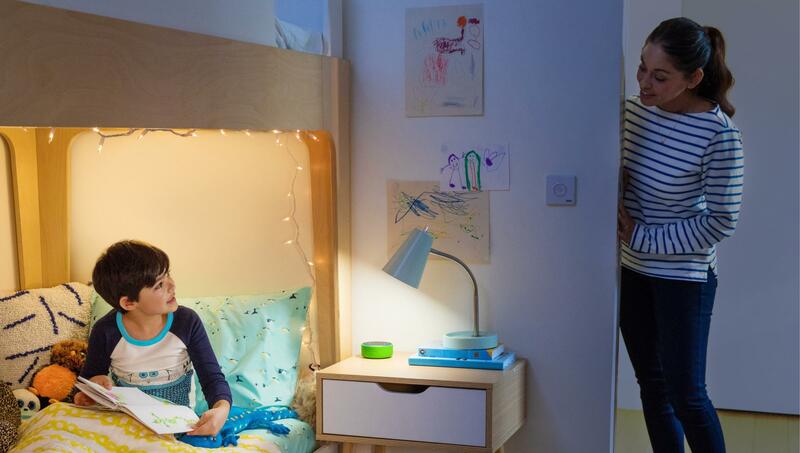 Amazon seems to be nudging families to feel comfortable around Alexa — to put an Echo in the playroom, or even in a kid's bedroom, as shown in a company promotional video. But is that really the best idea? Cassell says her research shows that interacting with AI "is endlessly interesting to children in different ways at different ages. And there hasn't been a lot of talk about how this is going to be used developmentally, and I think we really need to put it a lot more effort into that." Pamela Pavliscak agrees. She's a futurist and a professor at Pratt Institute who focuses on our emotional relationships with technology. In her research she's found kids and teens already often see Alexa "as a friend of the family." "It's occupying that weird space between a friend, a human friend, and something else. And I think for kids especially, their conception of that is so fluid." Up to now, Pavliscak notes, some families have found smart speakers more wholesome and engaging than devices with screens. Instead of interrupting your conversation with your kids to look at a phone, you can call out "Alexa, what's the weather?" and everyone hears the answer at the same time. But, some of the FreeTime Unlimited subscription offerings, like trivia games and audiobooks, offer kids the opportunity to engage with the device solo for longer periods of time. And, Pavliscak says, "They might use that as a replacement for other kinds of relationships that might be more meaningful." And, let's not forget that all these chummy conversations are recorded by default, which raises both privacy and marketing concerns. Amazon says it won't use that information to recommend products — outside of the existing library in its subscription service. And there are no ads on Alexa. At least, not yet. Our kids might relate to Alexa like a trusted friend, but let's not forget, says Pavliscak, "They're communicating with a big retailer through an app that's been made by hundreds of people on the other end." Cassell raises a different concern. What she finds "creepy" about Alexa is the parental controls: The power it gives parents to listen to their kids' conversations, while limiting what they hear or do. "With our children we walk a fine line between loving care and abuse of power. And healthy development means staying on the right side of that line." When it comes to the future of home AI, as with other technologies, Cassell says she puts her faith in children. She cites a video on YouTube of what looks like a very young boy demonstrating how to hack Amazon's parental controls. (Here's a similar one). This kind of rule-breaking, she says, is an expression of creativity — wanting to get under the hood and muck around with the tech. "What children need most is to be able to be producers of technology as well as consumers of content. Because what we all need ... is not to listen but to be heard. And if Alexa learns how to hear, and I suspect that children are going to try and make it so, then it will be a success." On this week's All Tech Considered - parenting with a digital assistant in your home. KELLY: An estimated 19 million households already own smart speakers with digital assistants. Think Amazon Alexa or Google Home. Now, many of those 19 million households include children. Manufacturers have taken note. Kids really like talking to these devices. Amazon is rolling out new features next month designed to make its Alexa even more kid-friendly. And that got NPR education correspondent Anya Kamenetz wondering, do parents want their children cozying up to digital assistants? UNIDENTIFIED CHILD: Alexa, how many miles to the Andromeda galaxy? ANYA KAMENETZ, BYLINE: That heartwarming bedtime moment was brought to you by an Amazon promotional video. Last week, the company, which supports NPR, announced an updated Alexa aimed at kids and parents. TONI REID: One of the things that we saw after we launched is that families loved using Alexa. REID: Humble, smart, helpful, sometimes funny. ALEXA: Pluto is awesome because it wasn't a planet. Then it was. Now it's not. It's considered a dwarf planet by scientists. Just because you're small, though, doesn't mean you're not important. ALEXA: By the way, thanks for asking so nicely. KAMENETZ: Alongside these updates, Amazon is introducing parental controls for the Echo device. Google Home, its biggest competitor, already has some of these controls. The Echo is also adding a version of Amazon's paid subscription service for kids called FreeTime Unlimited. Amazon seems to be nudging families to feel comfortable around Alexa, to put an Echo in the playroom or even in a kid's bedroom. But is that really the best idea? PAMELA PAVLISCAK: It's occupying that weird space between a friend - a real friend (laughter), a human a friend - and something else. And I think for kids especially, their conception of that is so fluid. KAMENETZ: Pamela Pavliscak is a futurist and a professor at Pratt Institute. In her research, she's found kids and teens already often see Alexa and other AI services as a friend of the family. Pavliscak says that's not necessarily a bad thing, but it could go too far. PAVLISCAK: They might use that as a replacement for other kinds of relationships that might be more meaningful. KAMENETZ: The controls let parents set time limits, but the other changes add up to a chattier Alexa, one who - let's not forget - records every conversation. Amazon says it won't use that information to recommend products to children not outside the existing library and its subscription service. There are no ads on Alexa and no plans for them, the company says. But in the future, Pavliscak says, who knows? PAVLISCAK: I mean, if you think about it logically, they're communicating with a big retailer through an app that's been made by hundreds of people on the other end (laughter) to - who have thought about a lot of different things to be sure. And it kind of starts to blow your mind. KAMENETZ: Justine Cassell at Carnegie Mellon has been building AI interfaces for children for decades. What we really should be looking for, she says, is ways that children can get under the hood of technology and have a chance to be creative even if that means breaking the rules. JUSTINE CASSELL: I hope this is true even though Amazon may not wish this - that children will learn how to hack Alexa. KAMENETZ: When I got a chance to ask the new Alexa a question in front of Reid and her colleague Josh Sherman, I had that same childish impulse to test her limits. ALEXA: People make people, but how they're made would be a better question for a grown-up. UNIDENTIFIED PERSON #1: That was a good one. UNIDENTIFIED PERSON #2: Nice try. KAMENETZ: Anya Kamenetz, NPR News. Transcript provided by NPR, Copyright NPR.